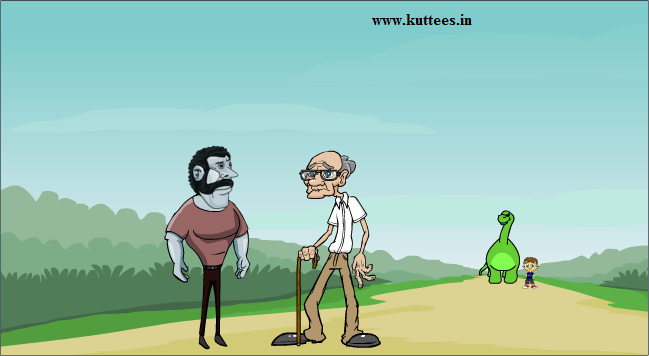 One day, Mr. Narayanan, an old man in the colony where Vicky and Dino lived was returning back from bank to his home. On the way a thief stopped and threatened to kill him if he didn't give the money he had. The old man tried to fight with the thief, but his couldn't do anything against the strong thief. Meanwhile, Vicky's mother had asked him and Dino to go to the near by shop and buy some butter for cooking. So Dino and Vicky were also coming in the same way. From a long distance, Dino could see the thief threatening the old man. Immediately, Dino rushed to that spot. Vicky ran back behind Dino. On seeing Dino, the thief tried to escape from that place. But Dino caught him and gave a big punch on his face. The thief couldn't bear the pain. He started shouting and begged for mercy. The Old man warned him and asked Dino to forgive him once. The thief ran away. The old man thanked Dino for his timely help.